I’ve reviewed the last two shoes in Chris Paul’s Jordan Brand signature line and generally found them to be good but not great overall. Being a point guard myself, I’m always excited to try out the shoe built for one of the game’s premier PGs, but something seems to be lacking in each model. The stiff Fuse upper of the VI compromised the fit for me and I wasn’t able to get full lockdown – unsettling in a lowtop. The VII had fantastic cushioning with the Zoom-based Podulon system and the materials were rugged, but again the shoe didn’t fit me properly. I had a hard time with the VII especially, because there were a lot of aspects I really, really liked about it and to this day I wear them all the time off-court. In both cases though, I thought that the material choice and build of the upper really hampered the overall fit of the shoes. 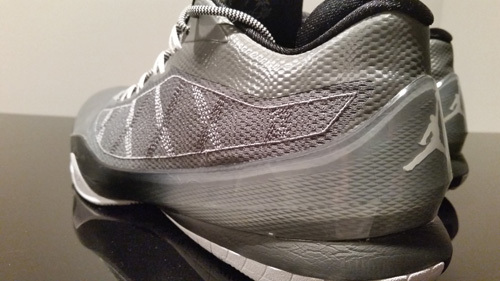 The CP3.VIII sees the introduction of a full length TPU frame and targeted Lunar/Zoom cushioning combo. Once again the shoe sounds great on paper, and this time delivers as a very good all around performer. The toebox is fairly tight, and I went with an 11.5 – even with a narrow foot I would not recommend going down a half size at all. I found the lockdown to be excellent for a couple of different reasons. First, the shoe used mesh/woven panels on both the medial and lateral portions of the upper – very similar to Engineered Mesh. Whereas the Fuse and other synthetics of the last two models kept me from getting a truly snug fit, the slight change in materials really helps the shoe fit more naturally on the foot. You’ll still get Fuse in the toebox and vamp areas, bringing with it stiffness and great durability. I didn’t find any hotspots or weird creasing with this combination upper. The other aspect contributing to the great fit is the full length TPU frame. Acting as the external heel counter and then sculpted all the way down the shoe, it provides heel lockdown and lateral stability for the quickest cuts. I wondered about the rigidity of it going in, but after a few wearings it began to feel more natural and three weeks in it simply feels great to be locked in. My only gripe is with the dynamic lacing system, as the laces run through little lace straps embedded in the upper. These straps don’t hold the laces when you try to lace them tightly from the toe up, so it’s difficult to get them laced as tightly as I want. With a fairly firm midsole, the TPU frame, and a harder, less flexible rubber outsole, the transition isn’t really the shoe’s strongest point. I found it to be a little slappy through the first four or five wearings – I noticed distinct heel and toe strikes – but it admittedly became more natural as I broke them in. It’s designed to be a more firm, responsive midsole and is also pretty supportive, so the transition gets sacrificed some here. As mentioned before, the stability is excellent in part due to that full TPU frame. But the shoe also plays very firm and low to the ground, making the shoe ideal for quick changes of direction. It’s not plush comfort by any means, but the Lunar foam directly under the heel is a nice addition and you get a large Zoom bag in the forefoot. Court feel is simply ideal. Responsiveness is good if not great. The Zoom bag is large and seems to be thick and bouncy (not all Zoom setups are created equal) but the extra firm midsole and slightly clunky linear transition saps some of the responsiveness here. It’s still good, and plays low enough and stable enough that you probably won’t notice too many issues in the responsiveness department. I had an issue with traction initially because I felt like the wavy pods picked up way too much dust for my liking, and I was constantly swiping through the first couple of wearings. The outsole is also a pretty firm rubber compound, and those typically take longer to break in as well. But after a few intense sessions, the rubber broke in a little and I barely noticed any slippage. There are portions of the outsole that hold too much dust because there’s too much of a flat surface and not enough grooves, so a dusty court may give you some trouble – but that’s the case with most shoes anyway. 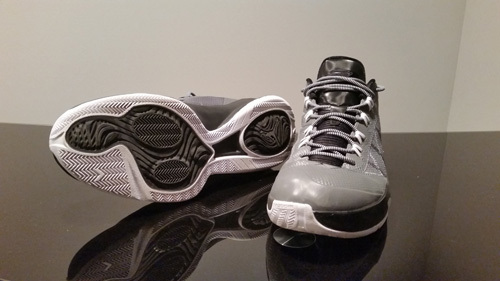 The CP3 line is typically built with tough, durable materials and the VIII follows that trend. It’s kind of a no frills type of shoe, and there aren’t a lot of areas I can see excessive wear building up. The outsole is pretty tough, though probably not setup for outdoor play, and the toebox features plenty of Fuse overlays. The woven portion is a tight weave and the build in general is very good. 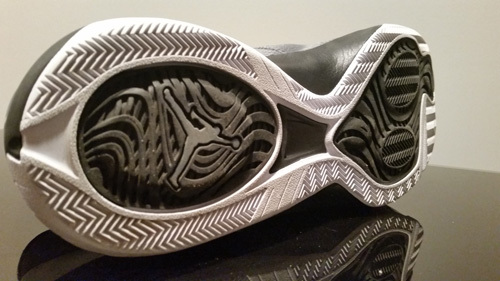 The only issue that could crop up would be with the lace loops (I had ones like these break on my XX9s) but so far, so good there. The CP3.VIII is without question my favorite Chris Paul signature of the last three years and it’s just a really good all-around lowtop. The fit is fantastic and the shoe plays low to the ground with good responsiveness; it nails the big areas needed for a good lowtop. A slightly different traction layout would be nice and it’s not as smooth from heel-toe as the other shoes I’d been playing in (it does improve considerably once broken in though). Surprisingly, it’s a sleeper favorite of mine and I’ll keep them around for when I feel like hooping in a pair of lows. which ones do you like better? 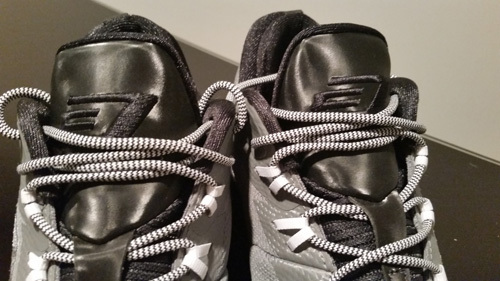 the cp3 7s or cp3 8s? and how do they compare when it comes to responsiveness? Thanks man. Personally I would probably go with the 8s (I haven’t put the graphic together to rank it in the categories yet but it’s coming), mostly because I like the construction and fit of the upper much better. I still wear the 7s a ton just as an everyday shoe because the podular Zoom is really comfortable, but I didn’t like it on court. I would say that neither is super bouncy and responsive, although the 8 felt like it played lower to the ground. The cushioning in the 7 was softer and probably gave you a little more response, but the 8 plays low enough to the ground that it’s pretty much even there. The 8 doesn’t have the smoothest transition and that hurts the smooth response some, but the 7 could feel clunky too. The 8, with the better overall fit, just suited me better. Thanks man. I’m trying to stay up on them, it just gets expensive paying retail for them all the time haha. I hope to get the HyperRev 2015s underway soon. But yeah that has been a trend for whatever reason. I could understand Bron, with the XI being built much different (narrower toebox) than most of his other shoes. And I think guys would have pressure from the shoe companies to wear the latest stuff. Doesn’t seem to be hurting sales much though, the XI went pretty big and I feel like KD 7s are doing well even with a million different colorways. JT. When can we expect that HR 2015 review? I’ve been anticipating it man! I keep up with most the big performance reviewers but your reviews have become my favorite. I’ve been slackin I know – life gets busy sometimes. But I should have time to get pics taken tonight, it’s still the only thing I need to wrap up. Thanks for the motivation haha. I’m in the process of figuring out what to do with the site too – I have a fine job but with a house, wife, truck, dog, etc. there’s not as much disposable income as when I started. Ad revenue is slow and it is expensive to generate content. I’ll have the HyperRev and Curry One reviews, after that I’ll have to see how often I can do them. You and a few other readers definitely have kept me going with the support and feedback though. Hey it’s cool man. I understand. I wish there was a way that we could get you more time and visitors to generate more revenue or what not because you definitely deserve it. Only way i can think of is to become a Weartesters partner and to make YouTube videos. I feel like Kickgenius and a few others have benefited from that route. Your reviews are definitely in their class, we just need to get them to a larger crowd somehow so that they can catch on. Yep YouTube is the way to go if you have the production value to match the content – always the biggest struggle for me. I’ve thought about putting some feelers out to other sites and just to see if partnering would be an option to generate enough to pay for the shoes. Not feeling sorry for myself – this is a hobby and that’s just the way it is. I don’t care to make any money off it and I don’t really want free kicks either, I like to pick what I review and what I’m curious about. But I’ll keep going and asking around and see if I can get hooked up on a bigger platform somewhere. Appreciate the comments man. Nice review jake ! I think you’re the first one to give these a good review which shows you aren’t just following the herd . Keep it up ! Nice review ! You’re on of the few I’ve seen that gave these a positive review . Good to see you aren’t followong the herd ! Thanks man. It’s not a perfect shoe, but ticks the boxes needed for a solid low top. a nice and all-rounded review! It really helps me a lot in chooosing whether I should go for it or not, btw, what would you suggest when it comes to the comparison of KD 7 and CP3 VIII? Cause I am keep struggling on this two shoes! Ive always loved shoes with responsive cushioning and cp3 being my fav player id love to cop these but is the insole cushioned? Not really – just a thin foam, not molded or sculpted either. Pretty basic stuff. The CP3.VIII is a good shoe, but I think there are others better from a pure performance standpoint. Thanks for the info! I am choosing between this and DRose 5 Boost now. This helped me get a lot better understanding of what to expect and I like the looks of the CP3 8 more but the performance of the Boost has me intrigued as I want cushioning. I love zoom air and the response though so it’s a mixed bag. I guess, like the comparison between the 7 and 8, it will come down to fit. Which would you prefer Drose 5 or CP3 8? I personally liked the Rose better because of the overall fit and the responsiveness of the Boost. The fitcage that extends up and holds the ankle/heel in place is awesome and the upper itself has great containment. Boost is bouncy and rides nice and low to the ground, and I found it more comfortable than the Zoom setup in the CP3. Also a lot smoother transition in the Rose too. I did like the CP3 – the TPU frame was a nice feature and midsole was acceptable, but the Rose is just a more advanced, better shoe in all facets in my opinion. Love the blog. Thanks taking the time to review these sneakers. In your opinion, What are your picks for a pointguard shoe? 3] Both indoor and outdoor? It seems that whenever I read a review, i’ll get ‘these wont hold up outdoors’ but the question of what holds up outdoors never seems to be answered. So thoughts? Thanks man! Honestly, I don’t play outdoors much. I’ve had hip surgeries in the past (makes me sound like an old man) and outdoor hoops exacerbates that. I play indoors a ton, just don’t hoop too much on outdoor surfaces. As far as point guard shoes go, my all time favorites are the Crazyquick 1 and Kobe VI. Both are difficult to find at this point though. 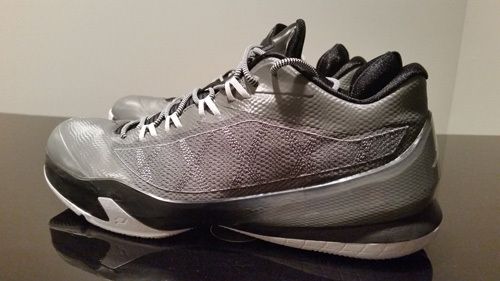 Currently, I’d lean towards the Rose 6 – great all around shoe but well cushioned and responsive for PGs. 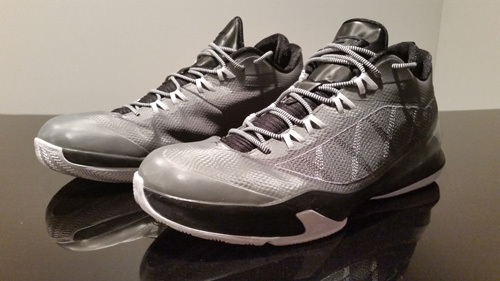 I haven’t picked up the XX9 low yet but they’d be a contender if they are similar to the mids.